Are you distracted by bright, shiny objects or just love attending gem and mineral shows? Here’s a tip: renting a motorhome instead of booking a hotel room is a much more economical way to visit your favorite gem shows. Spend more money on gems and jewelry by planning to cook most meals in your RV, and trade the noise and congestion of convention hotels for a peaceful RV campsite. Ready to head out to hunt for treasure? Here are just a few of the fabulous gem shows our customers go RVing to each year. This week-long, internationally-famous gem and mineral event is actually made up of many “mini shows” at multiple venues. Some events are open only to dealers, but there are enough open to the public to completely fill your week! The biggest public show of all is held the final weekend (always the second full weekend in February) at the Tucson Convention Center. Hundreds of gem, mineral, bead, and jewelry dealers set up shop at this expo and offer the world’s finest specimens to the public. Why not plan to spend at least a couple of days looking for treasure in Tucson next February? Stay at beautiful Beaudry RV Resort nearby to make your stay even more memorable. For fabulous opal and other gemstone finds, plan to spend a weekend in November in Anaheim. This is the largest opal show in the US, and you’ll find lots of other gems offered by dealers there, as well. Anaheim RV Village, in the heart of this exciting city, makes a convenient base camp for your visit. So why not come to California in search of opals next November? The second largest gem and mineral show in the country is held each September in Denver, Colorado. Thousands of gem enthusiasts and rock hounds flock to Denver to see this huge expo at the Denver Merchandise Mart. An added bonus is the variety of smaller gem shows held the same week in the Denver metro area. Our Denver RV Rentals office is the perfect spot to reserve your RV, so be sure to call early so you don’t miss this show. While you’re there, Denver Meadows RV Park in Aurora is a safe, comfortable campground about fifteen miles from the Mart. About an hour and a half east of Boston, MA, West Springfield hosts the East Coast Gem & Mineral Show each August. More than two hundred dealers display not only fine gemstones but also fossils and museum quality mineral specimens. Head for the show and use the money you save on lodging to take home plenty of treasure! 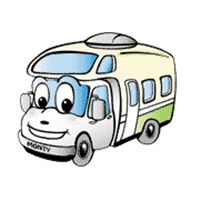 We hope you’re excited about finding a gem show to build a motorhome camping vacation around. Choose your favorite and book your rental RV early. Who knows? Some serious bling just might be in your future! This entry was posted in Gemstone Hunting, RV Vacation Ideas. Bookmark the permalink.